"Prince of Serbs", "of Serbia"
The Vojislavljević (Serbian: (pl.) Војислављевићи, Vojislavljevići) was a Serbian medieval dynasty, named after archon Stefan Vojislav, who wrestled the polities of Duklja, Travunia, Zahumlje, Rascia and Bosnia from the Byzantines in the mid-11th century. The main line of the Vojislavljević were ousted by their cadet branch, the Vukanović (which became the Nemanjić dynasty), in the late 12th century. 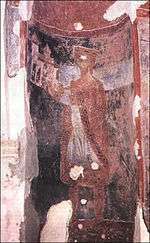 Fresco of Mihailo I in the Church of St. Michael in Ston. Mihailo I became Grand Prince around 1050/1055. He restored independence and maintained it from the Byzantine Empire. He sought closer relations with other great powers, such as the Pope and the Normans. Mihailo installed his son Petrislav as Prince of Rascia. After the aborted rebellion in Bulgaria, the military governor of Dyrrhachium, Nicephorus Bryennius, restored Byzantine rule to Rascia in 1073. Mihailo reportedly received royal insignia in 1077 from Pope Gregory VII, although this is still a matter of debate. An image of King Mihajlo with his crown is still found in the Church of St. Michael in Ston, a town in the Pelješac peninsula (in present-day Croatia). Mihajlo's rule ended in 1080. His successor was his son Constantin Bodin, who ruled from 1080 to 1101. Bodin fought Byzantium and Normans further to the south, and took the town of Dyrrachium. He established vassal states in Bosnia (under Stefan) and Raška (under Vukan and Marko), which recognized his supremacy. Vukan and Marko, the new princes of Raška were probably sons of the aforementioned Petrislav. Vukan (1083–1115) was the Grand Župan while Marko headed administration of a part of the land. The Byzantine Emperor Alexios later forced Vukan to acknowledge Byzantine suzerainty in 1094. After Bodin died in 1101, incessant struggles for power among his heirs weakened the state. Bodin had previously exiled Dobroslav, his younger brother, together with their cousin Kočapar. In 1101 they returned, and vied for power together with another grandson of Mihajlo's, Vladimir. Vladimir at one point married the daughter of Vukan of Raška. In 1114, Đorđe, son of Constantin Bodin, came to power in Duklja. The next year Vukan was replaced in Raška by his nephew Uroš I. (ca. 1115–1131). Đorđe's rule lasted until 1118. One of the sons of Uroš I was Zavida, Prince of Zahumlje. His four sons would eventually bring order to the Rascian lands and found the House of Nemanja. In these struggles, the pro-Raška rulers eventually managed to rise to power in Duklja, culminating in the rise of Stefan Nemanja, one of Zavida's sons (around 1166). His son Stefan Nemanjić restored the old Doclean crown in 1217 by receiving from the Pope regal insignia as "King of all Serbs and Maritime Lands". Stefan Vojislav "Prince of the Serbs" or "of Serbia"
1040–1043 Overthrew the Byzantine supremacy over Serbs in Duklja; founder of the Vojislavljević dynasty; in 1035 rebelled against the Byzantine Empire, but forced to sign an armistice; went to war again in 1040, which would be continued by his heir and son, Mihailo. Except Duklja, his realm included Travunija with Konavli and Zahumlje. Mihailo I "Prince of Tribals or Serbs"
1077–1081 Crowned King by the pope in 1077. Constantine Bodin "protosebastos and executor of Dioklea and Serbia"
1085–1091 Tsar of Bulgaria as Peter III in 1072. However, none of these are mentioned in contemporary sources. Wikimedia Commons has media related to Vojislavljević dynasty. ^ According to contemporary Byzantine sources, the members of this family was Serb. ↑ "Jean-Claude Cheynet, „La place de la Serbie dans la diplomatie Byzantine à la fin du XI e siècle", Zbornik radova Vizantološkog instituta , XLV, Beograd, 2008, 89–9" (PDF). ↑ Vizantološki institut (2006). Recueil de travaux de l'Institut des études byzantines. Institut. p. 452. ↑ Sofija Božić (1 April 2014). Istorija i geografija: susreti i prožimanja: History and geography: meetings and permeations. Институт за новију историју Србије,Географски институт "Јован Цвијић" САНУ, Институт за славистку Ран. p. 434. ISBN 978-86-7005-125-6. According to the Chronicle, the first Vojisavljević, Stefan Vojislav (1040–1043),38 was John Vladimir's nephew, whilst his mother was a princess of Raška (Chronicle, XXXVII). Even if the Priest of Doclea invented this, the claim of his Serbian ethnicity was given in contemporary Byzantine authors, such as Keukamenos, Zonaras, Cedrenus and John Skylitzes. However, the new history of montenegro ignores these sources and simply terms the Vojislavljević dynasty as Doclean – Montenegrin.